Based on the beloved classic Saturday morning cartoon, your adventure begins with a single mushroom home and a smurflightful plot of land. Harvest your smurfberries. Build charming huts, special mushroom houses, and beautiful bridges. And decorate your village with colorful gardens, lights, flower chairs, hammocks and more! FAMILY ADVENTURE – Build your very own Smurfs’ village and create a new home for the Smurfs. PLAY WITH YOUR FAVORITE SMURFS – The entire Smurf Family is here! Papa Smurf, Smurfette, Lazy Smurf, Baby Smurf, Handy Smurf, and Jokey Smurf. 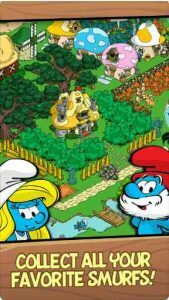 SMURFY MINI-GAMES – While your village is growing, play multiple mini-games like: Greedy Smurf’s Baking Game, Papa Smurf’s Potion Mixing Game, Painter Smurf’s Painting Game, Lazy Smurf’s Fishin’ Game and a new free Handy Smurf minigame to unlock additional bonuses. CONNECT WITH FRIENDS – Share your Smurfs Experience on Facebook and Game Center and send gifts to your friends’ villages. PLAY OFFLINE – Manage your village anytime without having to connect to the internet.